Facing another long holiday weekend (the last until Easter) we decided to extend it even more and take five days to explore Rome. 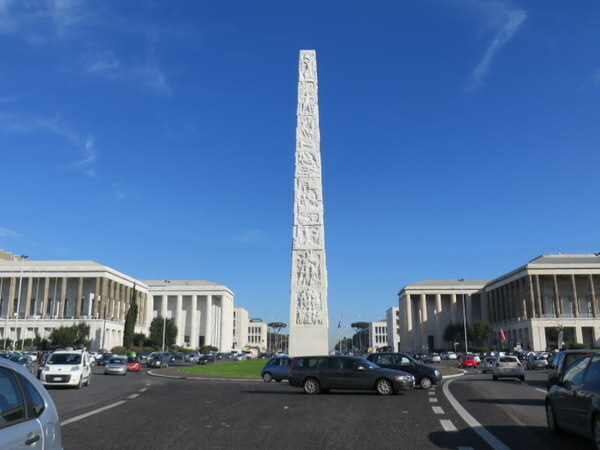 We have done so much traveling that the list of things to see and do in Rome continues to grow and we don’t have enough daylight hours to be tourists in our own town. So begins what I like to call i cinque giorni del compleanno di Laurel (the five days of Laurel’s birthday). 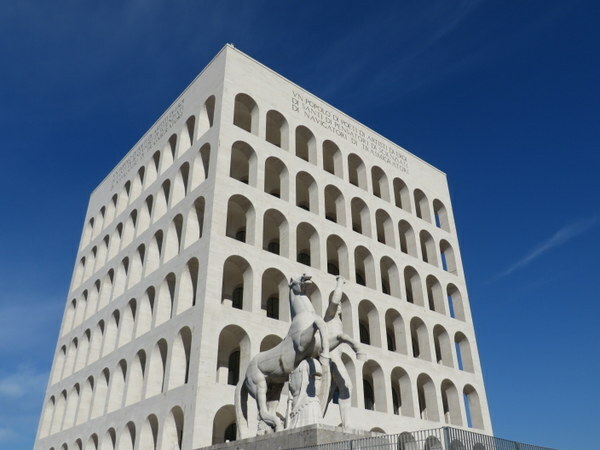 Iconic EUR “Square Coliseum”, unoccupied but rumored to be destined as Fendi headquarters. There are a lot of mega-sites in Rome: the Coliseum, the Roman Forum, Vatican Museums, Borghese Gallery, the Pantheon. The list goes on and on. And there are so many places the average tourist does not see unless she returns to Rome multiple times. We haven’t even managed to get to all of the neighborhoods yet. The obelisk and colonnades on buildings, along with wide boulevards, reminded me of Washington, D.C. So today we ventured south to the E.U. R., Mussolini’s site for a planned 1942 world’s fair, the Esposizione Universale Roma, which obviously didn’t happen. Today it is described as a residential and business area. We felt like we had left Rome and traveled to another realm. The architecture is interesting if cold, distant, and rather lacking in charm. The streets are straight, which is unsettling after so long in Rome. If you took in a certain view, it felt in places a little like Washington, D.C., but not nearly as pretty. Washington, D.C., for all its issues, has beauty. Still we were happy to have seen it as the weather was glorious for the first time in weeks. 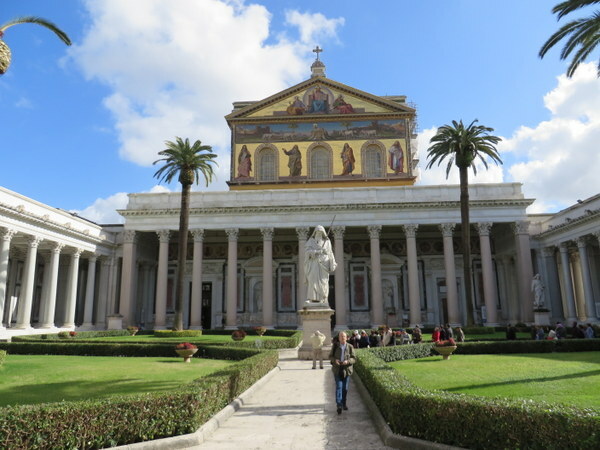 San Paolo Fuori le Mura (Ric in foreground). 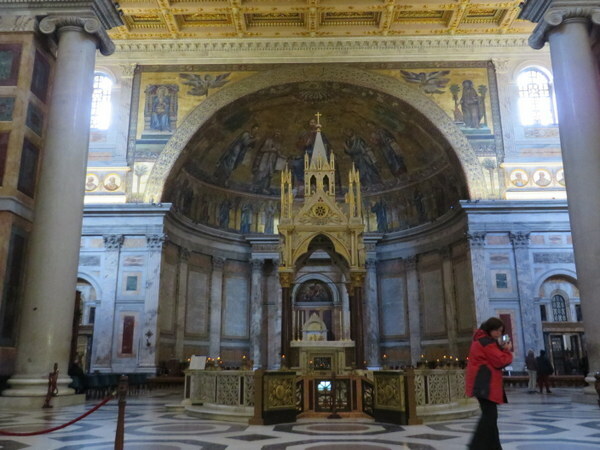 After the E.U.R., we stopped by the Basilica Papale di San Paolo Fuori le Mura, or St. Paul’s Outside the Walls. This is the fourth of four papal basilicas for us, and it has taken more than 3 years to get to all of them. Way off the track for most tourists, no exceptional art such as Raphael, Caravaggio, Michelangelo, or Bernini, but with lovely mosaics and peaceful. Of course since my hometown is named for this saint, it seemed fitting to visit. 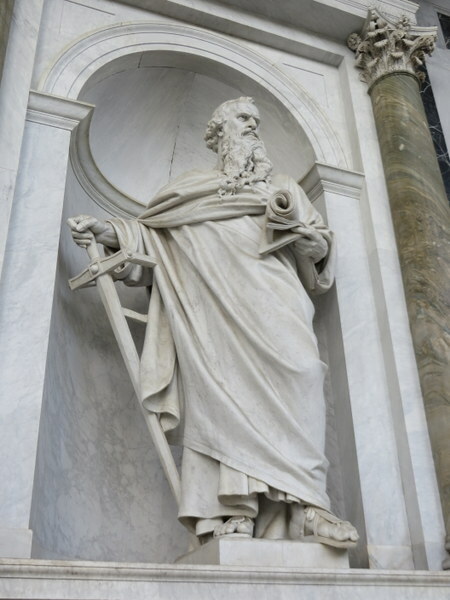 This uber-serious saint is the namesake of my home town. Alter canopy over the tomb of St, Paul. Lunch at Eataly, an afternoon on the couch watching a movie, and shortly dinner at my favorite fancy restaurant in Rome, QuarantaQuattro, where I know Sergio will make a fuss. When I hovered my mouse over this doodle, my name showed up. Strano! On another note, I was shocked to pull up Google this morning and find my birthday was a Google-Doodle. A Big-Brother moment; I assume they pulled the date from Facebook or Google+. Weird. Janet, You make me feel wonderful about my blog. Thank you! Miss you guys too!